The instant takeaway to this Oppo UDP-203 Ultra HD Blu-ray Disc Player review is that if you are home cinema enthusiast and are currently looking for a 4K Ultra HD Blu-ray player then it is a perfect purchase for you. You'll have to be King Midas rich too, however, if you fulfill both these criteria then there's no doubting that the UDP-203 will deliver the performance, quality and longevity to set you up for a decade or more. If, however, you are just an average Joe who wants to get into 4K Ultra HD Blu-ray and only needs a decent player to stick a few discs in every fortnight or so, then the UDP-203 is definitely not for you, with cheaper, less insane systems perfectly suited to your needs. If you're still reading here then it shows you are interested in the details which, if we're being honest, are where the quality, performance and comprehensive feature set of the UDP-203 really shines through. It is also the details that show you why you've just gone and dropped £649 on a 4K Ultra HD Blu-ray player and not a holiday to the Caribbean. Let's start with the specs, which are just outrageously good. 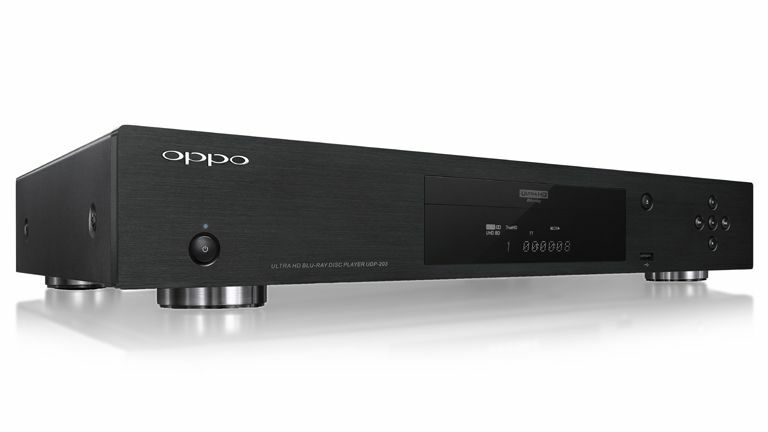 The Oppo UDP-203 is 4K, HDR, Dolby Atmos and hi-res music compatible; it also supports all and every video and audio codec format available today, including H.264, VP9 4K, HEVC, Hi10P, HDR10, any hi-res audio format and more, while it will spin UHD, Blu-ray, 3D, DVD, DVD-Audio, SACD and CDs. But wait, there's more. Its connectivity specs read like a wine list at a fancy French restaurant. Three HDMI ports, one for audio and video, one for audio only (in case your audio receiver doesn't support 4K or HDR), and one input connection for piggy-backing another HDMI device on the UDP-203's extension are yours with this player. As too coaxial, optical and 7.1 channel analog audio outputs. And that's not to forget the brace of USB 3.0 inputs on the rear, single USB 2.0 on the front, Gigabit Ethernet port, built-in Wi-Fi, and - yes, naturally - DLNA support for content access on any network attached storage (NAS). Every Oppo device we've handled here at T3 Towers has always boasted top build quality and, unsurprisingly, China's premium tech manufacturer maintains its reputation here, with the UDP-203 delivering a really solid, well made system. A rigid, steel casing is partnered with a a brushed aluminium front panel and silky smooth high-precision disc loader with balanced laser. The UDP-203 feels dense and cool to the touch too, while its front-mounted LED display shows plenty of playback information, with inputs from the player's full-size remote easily and consistently picked up. Speaking of the controller, film fans will be pleased to hear that they will be able to operate the UDP-203 even with all the lights turned down, as its buttons illuminate when pressed. The system is also pleasingly rectangular and non-standout in style, which we always think is a desired trait when dealing with this sort of home cinema tech as it means the UDP-203 will fit in and match well with your existing hardware in all likelihood. Multicoloured, non-stackable home theatre devices we do not like. We played a variety of Ultra HD Blu-ray discs on the Oppo UDP-203 hooked up to T3's TV of the moment the LG E6 and, to put it bluntly, the experience was superb. Batman VS Superman: Dawn of Justice was first up and everything from the spectacular set-piece fights, down to close ups of the fine mesh and kevlar on Batman's suit, looked amazing. All the film's dark scenes - and there are a lot! - were brought to life and had genuine depth too. Next up we through Mad Max: Fury Road at the UDP-203 and again, like many of Max's adversaries, we were blown away by the experience. All those rich, warm, post-apocalyptic colours were reproduced gloriously and with real vibrancy (and that tells you a lot considering the film is largely set in a flat, dusty desert). The high speed action, which has many fast cuts and snapshots, was also reproduced with incredible smoothness,with texture details still discernible. Naturally, the crispness of the image was first rate. Other films such as Salt, The Amazing Spider-Man 2 and Hancock were equally impressive. As we mentioned, out of the box the viewing and listening experience on the Oppo UDP-203 was superb, with discs loaded quickly (sub 30 seconds to film watch every time), and content quickly and easily accessed via the player's simple but effective menu system from USB or NAS. As such, there really wasn't any need for us to tinker in the system's comprehensive system options, however for those who wish it they certainly won't be disappointed, with the UDP-203 delivering resolution, frame rate, colour space, colour depth and many more options aplenty. Navigating through each menu was a lag-free experience too. The Oppo UDP-203 is an amazing piece of hardware and it chases down and then surpasses both the Panasonic DMP-UB900 and Samsung UBD-K85004K with ease, offering comparable build quality with the former and greater format support and features that either. However, and there is no way around this, rival machines are available for half the price. If you're a home theatre enthusiast and price is not an issue for you though, then the Oppo UDP-203 Ultra HD Blu-ray Disc Player should be a instabuy.